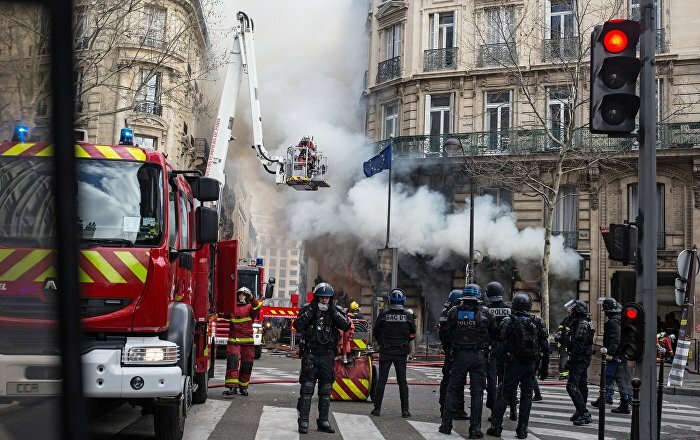 French President Emmanuel Macron condemned the turmoil organised by the Yellow Vests saying that the protesters were seeking to “destroy the Republic”. “What happened today at the Champs-Élysées is no longer a demonstration. These people want to destroy the Republic. Everyone who was there is complicit in what happened,” Macron said in a tweet. — Emmanuel Macron (@EmmanuelMacron) 16 марта 2019 г. In a tweet published earlier, the French president pointed out to the need for taking “strong decisions” to tackle the disorders. Emmanuel Macron’s remarks follow reports published a day before that a number of venues on the Champs-Elysees avenue in Paris were vandalised and ransacked amid a Yellow Vests rally. Yesterday’s rally took place during the 18th week of protests, which started in mid-November after the government announced its plans to spike fuel taxes. While the French government abandoned this proposal and took some steps to improve the country’s socioeconomic situation, protesters continue to take to the streets across France every weekend to express their wider discontent with the government’s policies.